I love the Olympic Games. We’re in-between Olympic Years, looking back at Sochi and forward to Rio. I always spend lots of hours glued to the TV watching the Olympics. Last year, I got into the various men’s and women’s Biathlon events which I hadn’t previously paid attention to or even understood — turned out to be fascinating and exciting. Also exciting were the newer Extreme competitions. I tried to get into curling, but that was brain numbing. Also, the sled races were a bore and I just fast forwarded to see who won. It’s difficult to pick one Olympian as my favorite. So many candidates! 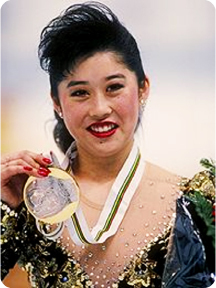 I guess I’ll choose someone who sticks out from the past — how about Kristi Yamaguchi who won Figure Skating Gold in 1992? Being from the Bay Area, she’s a local girl by my definition. Her bio is inspiring, and even her name is unforgettable — just try chanting ‘Kris-ti Ya-ma-gu-chi’ a few times over and over, and you’ll find that you won’t be able to get her out of your head for the rest of the day. She’s now in her mid-40’s and still has her trademark wholesome beauty and trim body. She’s a best-selling author of children’s books and her foundation promotes early childhood literacy. Kristi’s sole mis-step, in my view, was participating in Dancing with the Stars in 2008 — I really detest that show. She won, of course.